Officially known as the Northern California Cherry Blossom Festival (NCCBF), this wonderful spring celebration takes place over two full weekends each April in San Francisco's Japantown and attracts more than 200,000 people annual, making it one of the largest cherry blossom festivals in the U.S. and the largest festival of its kind on the West Coast. San Francisco's Cherry Blossom Festival coincides with the blooming of its cherry blossoms, trees that flower in various shades of pinks and whites and are Japan's national flower. The festival is also the perfect celebration for the city's Japantown neighborhood, a six-block enclave that centers around the Japan Center. At its heart, the festival is meant to showcase the diversity of Northern California's Japanese American community, as well as help foster an alliance between the two countries, though it's also come to represent the arrival of spring in San Francisco. The festival got its start in 1968 (the same year the Japan shopping center opened) as a cultural celebration known for its colorful displays and unique activities, of which it's always adding new things. It's held in the heart of Japantown, stretching along Post Street between Laguna and Fillmore streets, and is broken up into several sections. One of its main highlights is the festival's Grand Parade, a lively procession that starts at City Hall and winds its way through Civic Center and on to Japantown on the festival's final Sunday. There is always a wealth of things to see and do at NCCBF, which hosts a variety of entertainment, workshops, and event, and there's plenty of time to experience them ― since the festival is spread out over two weekends. NCCBF typically has an arts & crafts area showcasing the Japanese and Asian-inspired works of independent artists; a food and drink area, serving up a selection of Asian cuisine and Sapporo beer; a cultural section honoring Japan's intersection of old and new and consisting of things like anime, gaming, and fashion; a kid's corner; and the the Japanese Cultural & Community Center of Northern California (JCCCNC) indoor venue, which hosts a variety of traditional Japanese performances and cultural exhibits. NCCBF's Peace Plaza Stage is the main venue for many of the festival's performances ― which range from the festival's opening ceremony to a gathering of its Cosplay All-Stars ― while the Sakura 360 stage is known for its J-Pop (Japanese pop culture) happenings, including an Anime contest. Expect origami exhibits, workshops in traditional arts such as shishu (Japanese embroidery) and washi ningyo (Japanese paper dolls), martial arts, taiko drumming, bonsai displays, live music incorporating traditional Japanese instruments such as shakuhachi (bamboo flutes), and even a ramen noodle eating contest throughout. Food runs the gamut from bowls of unagi donburi (rice with barbecued eels) and fried mochi to more pan-Asian offerings like shaved ice, Spam musubi (Spam atop rice), and teriyaki burgers. The traveling Hello Kitty Cafe Truck has recently been making an appearance, and there are plenty of local restaurants ideal for grabbing a bite, such as Mums - Home of Shabu Shabu and the okonomiyaki favorite, Mifune Don. Sapporo is the brew of choice at the festival's onsite beer garden, which usually sits close enough to the Webster Street Stage to take in some music while imbibing. The festival culminates with its Grand Parade, which features its own Grand Marshal (in 2018 the parade's Grand Marshal was former American figure skater and Olympic champion Kristi Yamaguchi), classical Buyo (Japanese dance) and Minyo (folk dance) performances, colorful floats, SF's own Japanese percussionists Taiko Dojo, the festival Queen and her court, and the Taru Mikoshi, a more than 1000-pound portable Shinto shrine consisting of layers of sake barrels, multiple elevated platforms, and over 140 people carrying it along San Francisco's streets. 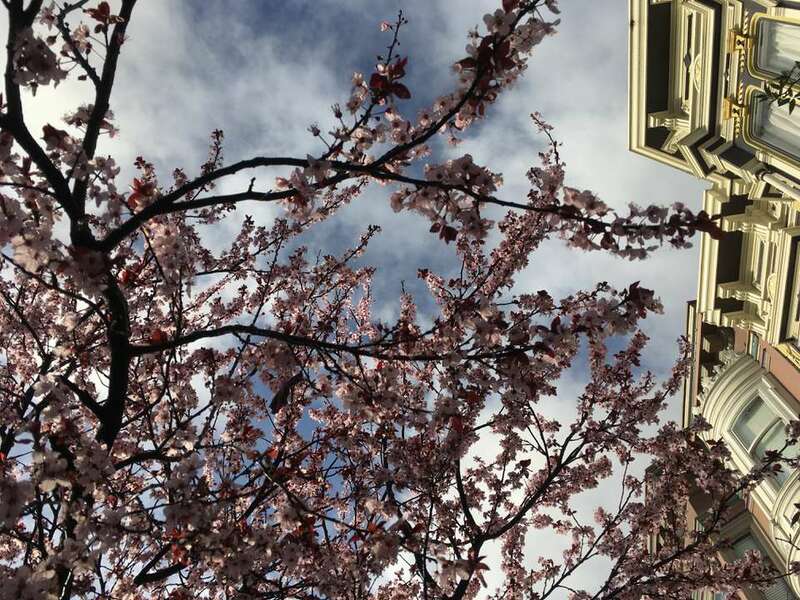 San Francisco's cherry trees are typically in full bloom when the festival hits, so keep an eye out for them (and keep your camera ready), especially in spots like Japantown and Golden Gate Park's Japanese Tea Garden. NCCBF hosts a pre-festival poster contest centering on the festival's theme of “One Blossom, One Community, One Heart,” and a photography contest in which participants are asked to capture the festival itself. Both are open to everyone, with more information available on NCCBF's website. Although the festival is free to enter, bring along cash for food vendors, artisan souvenirs, and raffle tickets (In 2018, the raffle's Grand Prize was $10,000, followed by two first prizes of 4-day stays in Japan). Dogs on leashes are welcome to attend. While parking is limited, there are many other ways to reach Japantown—including on foot or by bicycle, depending on where you live. If you're traveling via San Francisco Municipal Railway (MUNI) both the #38 Geary (east-to-west) and the #22 Fillmore (north to south) buses stop within a block or two of the festival. Those coming in from the East Bay or SFO can catch a Bay Area Rapid Transit (BART) train to San Francisco's Montgomery Street Station, then head up to street level and catch a #38 Geary bus to the intersection of Fillmore Street and Geary Boulevard.